A Tom McLuin fixed blade. A J.A.Henckels multi-blade pen knife. An unmarked multi-blade pen;possibly an A. Kastor knife. An unmarked keris blade knife with sheath made of half horn and half wood. A pair of poultry shears marked Grasoli with horn covers. Ray, that unmarked lobster with the spiral nail file really catches my eye, it is a beauty! All my Horn Handle knives go way back. Any ideas on this manufacturer? Bernard Levine calls the below two "English Medical Bistoury" knives circa 1815. 200 plus years old . Dan those are really interesting looking. I know nothing about them except that I really like them. Thanks for sharing. I have one more to share. A heavy duty Fleam. Unusual, can I see a picture of the top piece from the front? Miller Bro's wrote: Unusual, can I see a picture of the top piece from the front? 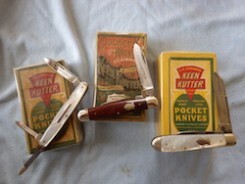 I think our "Cutlery Technology" has improved over the years. In its day, this would have been called a "Custom Knife" with a very inventive Bolster. Sorry I wasn't clear, the top piece of the fleam. Is it solid or hollow, pic posted below with arrows showing where I would like to see. It appears that it was a solid steel rod that was machines out to fit over the top of the Fleam and not bent over. A very well made English tool. It's what smiths call a taco, a flat piece of steel heated red hot and folded around the high carbon steel. No machining in the era this fleam was made. I have added "taco" to my knife vocabulary.